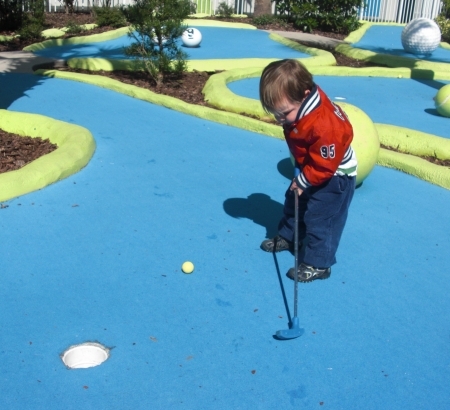 With onsite activities like an elaborate water park, miniature golf, and live audience-participation shows, the Nickelodeon Suites Resort in Orlando, Florida is a destination unto itself or an affordable hotel option for families who want to take free shuttles to nearby Disney World theme parks and other attractions. I recently spent four nights at the Nick Hotel with my daughter (Karissa, almost five), son (Leo, almost two), and mom (Grandma Ellen, 65). Read on to learn how you can win a two-night stay and other Nick-style fun for a family of four at the Nickelodeon Suites Resort! All of the rooms at the Nick Hotel are suites. (As a light-sleeper, all I can say is, Halleluiah!) We stayed in a two-bedroom KidSuite, with bunk beds in a character-themed room, a king-size bed in the master, and a pull-out queen sofa bed in the living area. There was also a kitchen area equipped with a small fridge, sink, microwave, and coffee maker – making simple breakfasts and snacks a snap. A suite allows for better sleep, and therefore less cranky pants and a happier vacation for all! After a long day of air travel (with a screaming toddler) from San Diego, we wanted to take it easy our first full day at the Nickelodeon Suites Resort. However, the overcast weather did not cooperate with our plans to explore the on-site Lagoon Water Park and Pool. I worried there wouldn’t be enough to keep us occupied, but there was plenty for us to do! First we played a couple rounds of free miniature golf. Even my little guy got in on the action! After lunch and naps, we headed to The Mall. 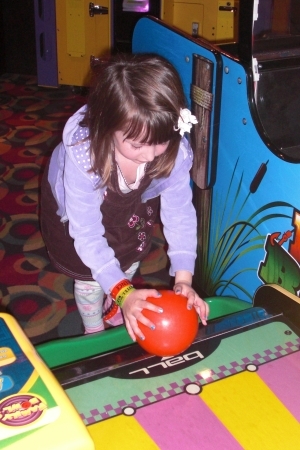 From restaurants to entertainment and shopping, you can find all sorts of indoor fun here. 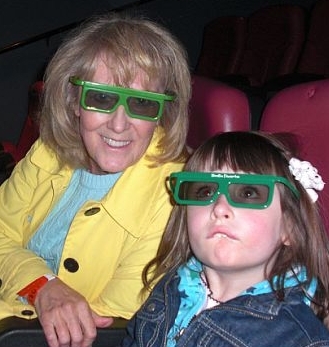 First, we checked out Nickelodeon’s 4-D Theatre. We sported 3-D glasses to experience stuff “jumping” out at us from the movie screen. The fourth “D” came in the form of misted water, scents (think flowers), and rumbling seats. You can pay per flick, or for a little more, get a wristband for unlimited viewing throughout your stay. My daughter was scared by the first movie, Deep Sea, about ocean creatures but she stuck it out nonetheless. Her brother, on the other hand, started crying less than one minute into the film so I had to whisk him away. I took Karissa back in for a viewing of Nick Jr’s The Wonder Pets: Save the Sheep! This show did not require the glasses and was more her speed. Next stop? The Kid’s Spa. Karissa chose sparkly blue from a rainbow of colors for her finger nails. She’s quite the girly girl and loved the attention from her sweet nail technician. The spa also offered temporary tattoos (for both boys and girls), hair braiding, and pedicures. Minding the pretty nails, we headed for The Arcade, where there were games for little ones (virtual bowling and mini basketball) to teens (ski ball, Guitar Hero, and air hockey). The kids earned points while playing, and redeemed them for little trinkets and toys. Before dinner, we attended Nick Live Goes Wild, a high-energy audience-participation game show at Studio Nick. The losing team’s dad got a cream pie in the face, while the winning team’s tween son got doused with slime (which, apparently, was a really cool thing for a boy that age)! Late night shows included Family Improv, Who Knows Best?, and Karaoke. Nick After Dark was also located in The Mall for children ages five through twelve. Alas, my children were too young to participate but backstage passes to the Nick Studio and hands-on slime-making would be enough to keep most kids happy for an evening while mom and dad slip out for some grown-up fun. There was so much to do- I couldn’t squeeze all of the information about the Nick Hotel into one story! Check back next week to read about character dining and the resort’s fabulous water park in Nickelodeon Suites Resort – Part 2. Want in on the fun? Enter to win a two-night stay below or book a two-bedroom KidSuite for just $99! That’s nearly 50 percent off the average standard rate! This awesome rate is being offered for a limited time to Travel Mamas readers only. The final date to book this deal has been extended to February 28, 2010. Learn more about this offer. Enter to win a two-night stay in a two-bedroom KidSuite at the Nickelodeon Suites Resort! The winner will also be awarded one character meal (for two adults and two children), four 4-D Movie wristbands, 300 points for use at the arcade, and a gift basket of Nickelodeon goodies. Approximate value is $500. The contest ends on Saturday, March 6, 2010. The winner will be randomly selected using RANDOM.org and will be notified via email. If the prize is not claimed within one week, the winner will forfeit the prize and an alternative winner will be selected. Based on availability. Not valid during Holiday Weeks, Special Events and Expected Sell-Out Dates. Two Night Accommodations (Room and Tax) Resort Fee Not Included. THIS CONTEST IS NOW CLOSED. The winner will be announced on Travel Mamas on Monday, March 8, 2010. 1) Make a comment below about why you would like to have the “slime” of your life at the Nickelodeon Suites Resort. All generic comments like, “Thanks for the contest” or “I want to win” will not count as entries. 2) Tweet this contest! Copy and paste the following phrase into Twitter. Be sure to post another comment with a link to your tweet! 3 & 4) Read Nickelodeon Suites Resort – Part 2 to enter the contest two more times now! I would love this. I have always wanted to do this. I live right here in Florida,but just never have the money. I would really like to win this trip because my daughter will be going off to college in the Fall and I would love to have one last memorable trip prior to her leaving. It would be a treat because it would save us money that we really need for her college expenses right now. I would love to see my son smile and laugh, I want my husband to be slimed! I would love to travel and make the memories! What a great vacation! My daughter would love this. Any her grandfather that she hasn’t seen in several years lives not too far from Orlando. I would like to have the slime of my life at the resort because we are planning a family vacation to florida this summer and we are still in the process of arranging the accomodations and flight itinerary. This would be a great place to stay. It sounds like such a good time. We will be traveling with two kids two adults and my parents and brother and sisters’ families. I wasn’t aware of this resort so thank you for the information. Me and my nephews look forward to getting slimed at the Nickelodeon Suites Resort. I would welcome being slimed to get out of the current daily routine. i would love to have the slime of my life here because i am really just a big kid! Besides my daughter would love it! I would love to have the slime of my life there because I’m am thoroughly impressed with the amount of activities offered in the resort! It looks like too much fun and so much to do! thanks for the giveaway! I would like it because I think it’s something the 10-yr. old and 16 yr.old would both love to do together! My family are big Nickelodean fans! We would love to have the opportunity to see the Nickelodean Studio’s firsthand. My daughter wants to goto FL so bad. I want my family to have the slime of their life at nickelodeon. I think this would tickle my daughter to no tomorrow. We have not been on vacation in awhile this would be awesome. I would love to go because I think it would make for a very memorable experience! I would love to take my kids to where their favorite characters live—and even decorate the walls! And the idea of a suite sounds divine! I would love to take my nephew there! Well, we’ve never been to theme park like this before. Not even Disneyland, so it would be a first. We took our kids when they were quite a lot younger and it would be so much fun to take them back again. I’ve been discouraged lately because my kids and I have had a rough few months – I really wanted to try to scrape together a trip for them this summer but the budget is tight! They would FLIP for the Nick hotel and this would sure help the budget woes if I won a stay! That slime takes me back to when I was young and would watch “You Can’t Do that on Television” on Nick myself! Thanks for the giveaway! My daughter is still just enough of a kid to love this. She’s my last and I won’t have kids when she becomes a teenager to enjoy stuff like this. (Actually, I’ll go with anyone it sounds like a blast. My 15 yr. old daughter, Sarah has Crohns Disease, and had surgery on Feb. 4th. (It was mine and my wifes anniversary) We spent the whole mo. of Feb. at CHOA, and she got out of the hospital on the 27th. Were now home , and all recovering! Shes never been to Orlando and the magic there, and would love to go! If I can take my husband away from his (4:30am til 7pm:Mon thru Fri) and (4:30am til 9am: Sat) navy job and we can enjoy this time with our 2 years’ old and 4 years’ old daughters,uah! I will delighted! I would like to have the ‘slime of my life’ at the Nickelodeon Suites cause everyone in my family is a HUGE fan of all things Nick…and my kids have been begging me for this for a long time now! My kids have grown up with Nick. From Blues Clues and Little Bear, through Little Bill, Franklin, Jimmy Neutron, and of course Spongebob. Even now they still watch iCarly and Drake and Josh. I’ve enjoyed the programming Nick provides compared to other kids television. 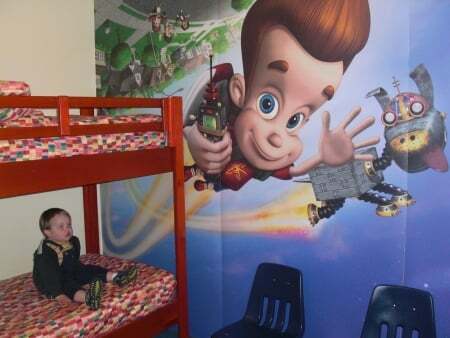 I’d like to take my kids on vacation, and a Nick themed hotel would do just fine. I would like to have the slime of my life bevause my granddaughter loves to watch Nick. I would love to take her on vacation to Nick. Wow! awesome post! I’m sure my daughter would love and enjoy this place. Thanks for the info! My daughter and I would do anything to win this trip…we LOVE to have fun!! !